Medieval swords for sale include all types of popular designs. Whether you want to shop for a display sword, cutting sword or for a battle ready reenactment sword, numerous options are available. 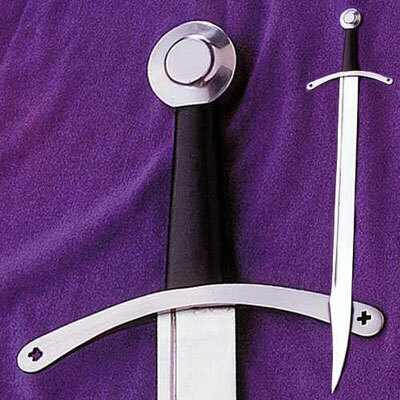 Display pieces for sale include the legendary Excalibur and the swords of the Knights Templar and Robin Hood. Functional medieval replicas available include Viking and Norman designs. Buy all styles of medieval swords from this great collection. Falchion Swords for sale are 34 inches in all. The Falchion is inspired buy real medieval swords that were used in the 13th century and resembled the Persian scimitar and Chinese Dao. This modern version features a functional tempered high carbon steel 28 inch blade. The single edge blade is 1 ¾ inch wide and 3/16th inch thick. The guard and pommel are made of steel and the wooden grip is wrapped in real leather. These swords include a genuine leather scabbard and weigh 3 pounds. Buy the medieval Falchion Swords for $179.99.